The Medvat Gel Warmer is the ultimate solution for Ultrasound Technicians and Massage Therapists. Designed to evenly and uniformly warm gels and oils, the Gel Warmer will eliminate any discomfort that usually occurs from skin contact with cold materials. No need to rub your hands in the hopes of warming them before a client, use this massage oil warmer for instant results instead! With customizable temperature and an adjustable timer- it’s never been easier to put your patients’ and clients’ comfort first. And with hospital grade quality you know you’re getting the best value and a product that will last. Give yourself the advantage and buy now! Buy Top Quality Double Bottle Gel Warmer by MEDVAT | Good for Bottles of Ultrasound Gel and Massage Oils and Lotions | Experience Deeper Relaxation and Comfort – Built in Timer at Discounted Prices ✓ FREE DELIVERY possible on eligible purchases. Ultrasound Comfort - Allow your patients to relax and breathe easy without the jolt of the cold gel on their skin. The Medvat Gel Warmer will help you to do everything possible to make your patient comfortable and at ease during the appointment. Massage Experience - Imagine letting clients enjoy the full benefits of massage by removing the initial chill of the oil or lotion when it touches the skin; it will transform the experience. Trust us; your clients will thank you! 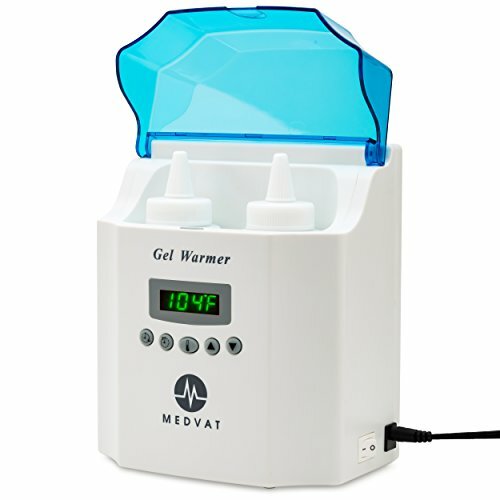 Customize to fit your needs - The Medvat Gel warmer will uniformly and evenly heat your gel or oil to the temperature of your choosing and for as long or short as you like. You can customize the temperature based on your client/patient's preference to optimize comfort. And with a built in timer- you won't have to remember to turn it off- simply enter the time you want the warmer to go into Sleep Mode and it will turn off automatically at that time. Save Space - Another advantage of the Medvat Gel Warmer is that it is conveniently wall mountable, a great benefit in a small or crowded space. Don't let a bulky device clutter up your surface- just mount the warmer on the wall and it will always be at hand when you need it. 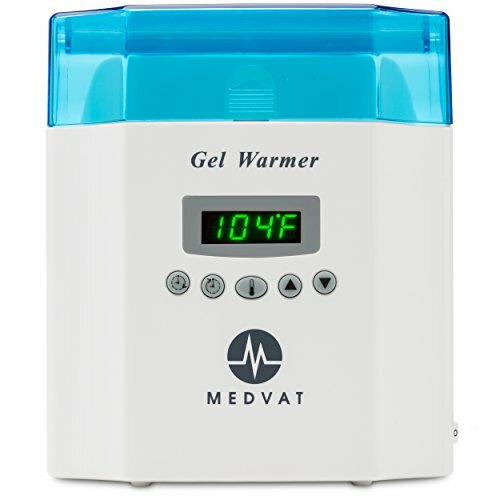 Neat Design - Whether you're looking to buy for a business or for home use- the Medvat Gel Warmer is the right choice! Unlike other clunky and industrial devices, ours is inconspicuous and subtle- so you it'll be there when you need it without clashing with your aesthetic.